yay!! and she’s in her favorite spot! Yep! She’s right between the two boys. Although you can’t see Stetson in this picture. Thanks! She was a good house guest. This little Yorkie is always a good little house guest. She’s a little bit shy around my dogs, but I think someday she will be more relaxed around them. 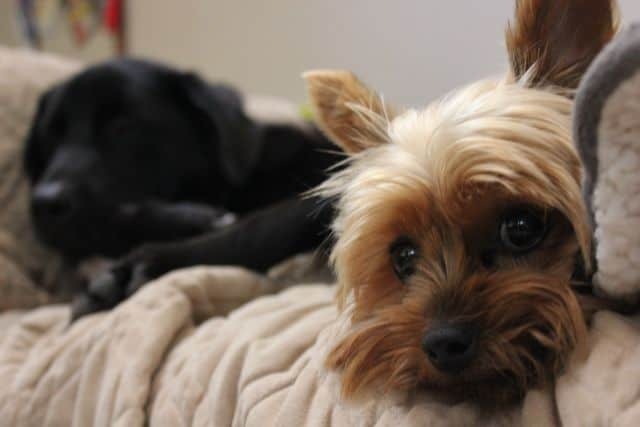 I always fall for a Yorkie….sigh. Thank you Linus, Stetson, Colby and Ali for taking care of Yuki. I hope she behaved and wasn’t too much trouble. She was well behaved this time. Didn’t pee on Linus’ bed.